In February of last year, I wrote an entry on Bessarion's Little White Dog and used the two dog painting I have here. I think I'may have identified the two dogs here, as to species, even though there are some differences between them. Apparently from ancient times on up to modern, this white toy Maltese -- with some breeding changes over time -- has been traditionally identified as a lady's lap dog. If Bessarion did have one, he wouldn't have worried about that issue. Odysseus (xvii: 315) compared his hunting dog Argos to lap dogs. He called them τραπεζῆες κύνες -- table dogs, the kind of dogs we here who are partial to mastiffs and karabaş might in an off-moment call a "kick-me" dog, though I have been known to become sentimental over a King Charles Spaniel. 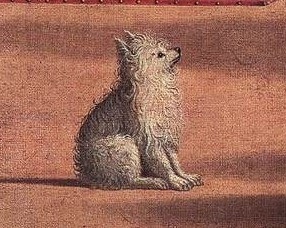 What is particularly interesting about this over-enlarged blurry dog is Aristotles' comparison of the Maltese to a mustelid, and it does have a slight resemblance to a weasel. These little white dogs are also found in the writings of Pliny, Strabo, Martial, and possibly first of all in Callimachus. They have an tradition in scholarly writing, which may be why they appear with images of Bessarion. Or maybe he really did own a little white dog. I keep hoping. It is better to be ready for war and inexpensively dressed than to wear golden robes and live in dread of your enemies. Or one may compare the way of a shepherd, who will feed a guard-dog from his produce rather than waste it on keeping Maltese whelps, or other useless or voracious animals . . . like one or two of those you are now keeping, who flatter and deceive you , with their mouths wide open . . . unable to restrain their greed. He is mixing a lot of metaphors here and making a lot of points, but contempt for Maltese whelps comes through. Along with your other faults, lying comes naturally to you. . . .
. . . a man who has no shame in boasting about the influence of a wretched woman -- and a little tart at that . .
You are not only vindictive, but dull-witted, as your present work shows . .
[You] enjoy discussion, which is a practice of moderation, as well as simultaneously enjoying your own vanity, which is deplorable and tasteless and has nothing in common with moderation; and you seem to be so consumed with your vanity that you will even sacrifice your religious beliefs for it, changing them at every opportunity in whatever direction you think will bring you greater esteem. . . They are certainly not stupider than you, for it would be hard to find among serious students of Aristotle anyone stupider than you. . . I have found these remarks devastating. Scholarios' response is a matter for another entry. 1Woodhouse 1986: 283, 285, 166, 298, 299, 307.